It’s high time we commence alfresco dining now that spring has sprung and summer is around the corner. These warmer months were made for breaking bread with friends and family under sunny skies and shady trees. 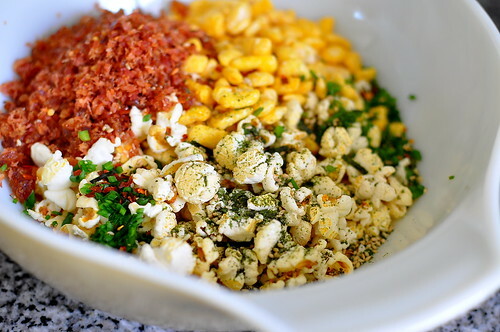 While the burgers are grilling or the ribs are smoking, I highly recommend serving a big ‘ol bowl of Furikake Kettle Corn. It’s an addictive nibble that never fails to delight. This recipe comes from Chef Roy Choi of Los Angeles’ A-Frame restaurant. I couldn’t keep my hands away from the bowl the first time I tried this Hawaiian-style popcorn. 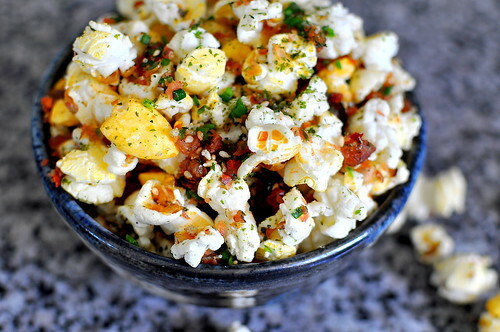 Every fistful of buttery kernels brought a hit of sweetness from Corn Pops, sourness from dried pineapples, savoriness from bacon, spiciness from cayenne pepper and chili flakes, and a whole lot of umami-ness from furikake. This unlikely combination of big, bold flavors had me hooked at first bite. 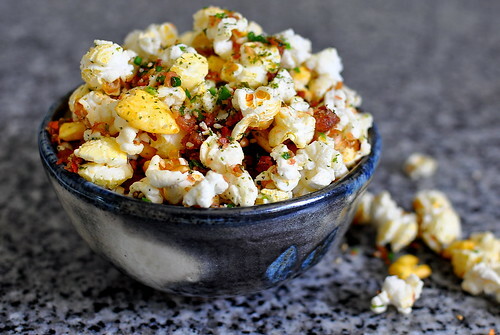 Making Furikake Kettle Corn requires very little preparation, especially if you’re using bagged kettle corn like this recipe suggests. 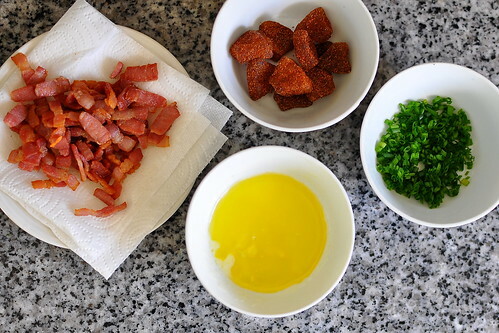 The bacon needs to be fried and chopped, chives minced, and butter clarified. After that’s good and done, everything comes together in a snap. Serve the popcorn in a bowl, or better yet, channel the aloha spirit and spill it onto the table just like they do at A-Frame. My “Qwik and EZ” method for clarifying butter entails microwaving the butter in a small bowl for 20 second at a time until it’s completely melted. Let the butter cool for a minute or two at room temperature and then skim off the white foam with a spoon. The resulting clarified butter isn’t perfect, but it’ll do just fine for this recipe. 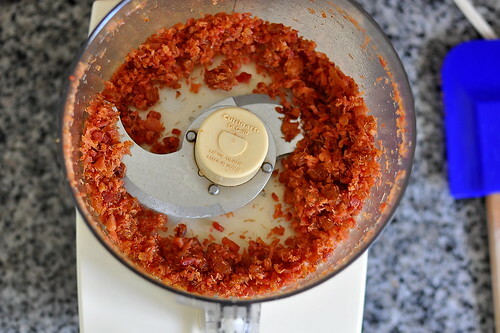 Finely chop the bacon and dried pineapple together using a food processor. In a large bowl, add all of the ingredients and mix well. Hey G – Add arare to it, minus the pork products and you’d have what we call a “Hurricane” back in Hawaii. Kirk – Mmmm, boy! As a matter of fact, I think Roy was inspired by hurricane popcorn for this recipe. The food at A-Frame has a Hawaiian vibe; I think you’d dig it. I can’t wait to try hurricane popcorn the next time I’m in Hawaii! Sounds totally up my alley. Glad I could be a part of the sourcing of ingredients! This does look quite simple to make. I need to make this like ASAP. I never tried this version of the kettle corn when I was there (I’m fairly certain the previous version didn’t have pineapple and bacon). Esi – The pineapple and bacon totally make this dish. You will LOVE! I’m making this as we speak! This is a strange and fascinating recipe. One question, what are corn pops? Is that like a breakfast cereal? Susan – Exactly! Corn Pops are kind of breakfast cereal. The box looks like this.